Hogue Inc. is an American corporation founded by Guy Hogue in 1968. Guy was a police officer with the LAPD who set about making himself an improved grip for his state issued revolver. Before long his custom made grips were in high demand and the Hogue company was born. The early success of the business was primarily attributable to handgun grips and rifle stocks and the Hogue brand became synonymous with American manufacturing quality and tradition. In later years the business was handed down to Guy’s sons Aaron and Patrick who partnered with the master tool maker Jim Bruhns and the business began to diversify. Guy’s grandson Neil has also joined the team and the company continues to focus on innovative design, craftsmanship and high performance – all made in America. Today the Hogue company classifies it’s products in six key categories: Grips, Stocks, Holsters, Gear, Tactical and Knives. Hogue’s first venture into the world of knife making came in 2010 when they collaborated with knife-maker Allen Elishewitz and debuted the EX-01 folder. 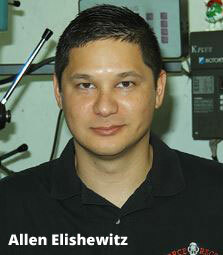 Elishewitz is a former marine with a background in martial arts and began knife making in 1988. Combining his tactical experience with his passion for the classical arts, Elishewitz was able to achieve early success as a knife maker and became the youngest member of the American Knifemakers Guild in 1994 where he now serves on the Board of Directors. Hogue and Elishewitz continued their partnership with subsequent releases in the EX-02, EX-03 and EX-04 “Extreme Series” of folding knives. This fairly recent partnership has been well received in the knife community, with the effective combination of Elishewitz’ award winning designs and Hogue’s first class US-based manufacturing processes. It didn’t take long to realize that Hogue was serious about it’s knife making and giving customers the quality they deserve. The Hogue Extreme Series (“EX”) offers a great deal of variety to consumers in terms of blade styles, handle materials, locking mechanism, deployment mechanism and overall aesthetics. The one consistent theme however is that these are all hard use tactical blades. The EX-01 was Elishewitz’s first production folding knife under partnership with Hogue. It comes in tanto or drop point blade styles in 3.5 or 4-inch sizes and G-10 or aluminum frame with several different colors/finishes. Like all the EX-series models, Hogue uses cryogenically heat treated 154CM stainless steel hardened to around 57-59 HRC. As you’ll come to realize with all of the Hogue folders, they simply look stunning. The EX-01 features ambidextrous thumb studs and a button release lock which you press to disengage the locking mechanism. They also feature a manual safety lock which will prevent accidental closure when engaged. The 4-inch version measures 8.8 inches in total length with it’s smaller 3.5-inch blade cousin measuring only 8 inches in total. The oversized pivot provides a smooth action making the EX-01 really fun to use. There are also EX-A01 auto models which are very snappy indeed. The EX-02 differs from the rest in the series in that it uses a stainless steel liner lock instead of the button. Again Hogue offers plenty of variety here with blade shape, size, handle material and deployment mechanism. The manual safety found on the EX-01 is also present here on the EX-02 and you can opt for flipper or thumb stud models. The 3.375 inch blade model measures 7.875 inches in total and the larger 3.75 inch blade measures 8.75 inches in total. What you also get with the EX-02 is an impact pommel and a unique pocket clip compared to the other models. Again the finishes here are really impressive and make the knife really pop in terms of visual beauty and aesthetics. The Hogue EX-03 is similar to the EX-01 but this one is all about the one-piece polymer frame. Again it comes in two sizes, a 4-inch or 3.5-inch blade in drop point or tanto and a choice or brown or black handle. Like the EX-01 the button lock and manual safety are seen again here on the EX-03 and opening is via the thumb studs. Again, the unique thing about the EX-03 is this insanely strong reinforced polymer frame and absence of any liners. This makes it relatively light. The frame also comes with an impact point on the rear for breaking glass, etc. Perhaps a little less visually appealing compared to the other models but still a great looking knife which is built to last. The EX-04 is the latest Extreme Series offering from Hogue/Elishewitz and perhaps the most striking. It features a beautiful G-10 handle in a variety of colors/patterns (Hogue calls it G-Mascus) and again comes in both 3.5 and 4-inch blade sizes. Yet again we see the button lock and manual safety switch. We also see the familiar Hogue 154CM blade steel and a couple of blade shapes in a wharncliffe or upswept style, all in black with double hollow grind I might add. Really comfortable in the hand and wonderfully made all-round the EX-04 is a hard-use tactical that looks stunning. Winner of the 2013 Blade Show’s American Made Knife of the Year award. In 2016 Hogue introduced the X5 with its “revolutionary deployment technology providing class leading smoothness and effortless action”. While we have yet to review the X5 it sure sounds appealing and in consistent Hogue fashion the aesthetics are anything but dull. Another Elishewitz creation, the X5 uses cryogenically treated CPM154 stainless steel with black cerakote finish and 6061-T6 anodized aluminum with black G10 inserts. That’s a lot of black. Hogue has also released a number of innovative and well crafted fixed blades which also sport the “EX” branding. Examples include the EX-F01 and F02 outdoor field tools, the EX-F03 neck knife and recently the EX-T01 tomahawk. All made in the USA just like the folding blades.